Fr. Jeremiah has started a class on the Gospel of John – The Word Made Flesh, a Study of the Book of John. It is starting out to be an in-depth and enriching study. Father Jeremiah is a beautiful teacher and is rich in knowledge and understanding of the languages from which the texts came from that produced this beautiful book of the Holy Word of God. Our lessons will unfold throughout the rest of this school year. 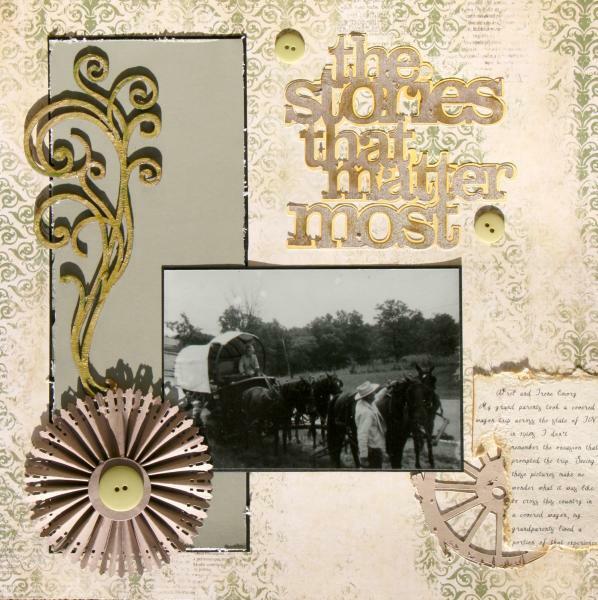 I will not write about the lessons, but hope to share more Bible Art Journaling as I am inspired to create. Not only will this be an eye-opening study for me but I hope to explore my desire to both write, perhaps essays, and do some art to expand my creativity. The opening of this book is so touching and beautiful! I encourage you to explore the deeper meaning of what John tells us by his prologue – “In the beginning was the Word”. Switching between craft activities keeps the energy level up for continuing when I feel stale. There can be a risk, though, of leaving projects unfinished which would be counterproductive. When I get to a point where a craft project seems routine and the creative juices stop flowing that’s the time I start craving a different project. That old saying about “once it’s begun, finish it” echoes in my head, seems to be the motivation to complete whatever I’m doing, already feeling happy anticipation because of the prospects of the new project, so I switch gears and work through the current task. 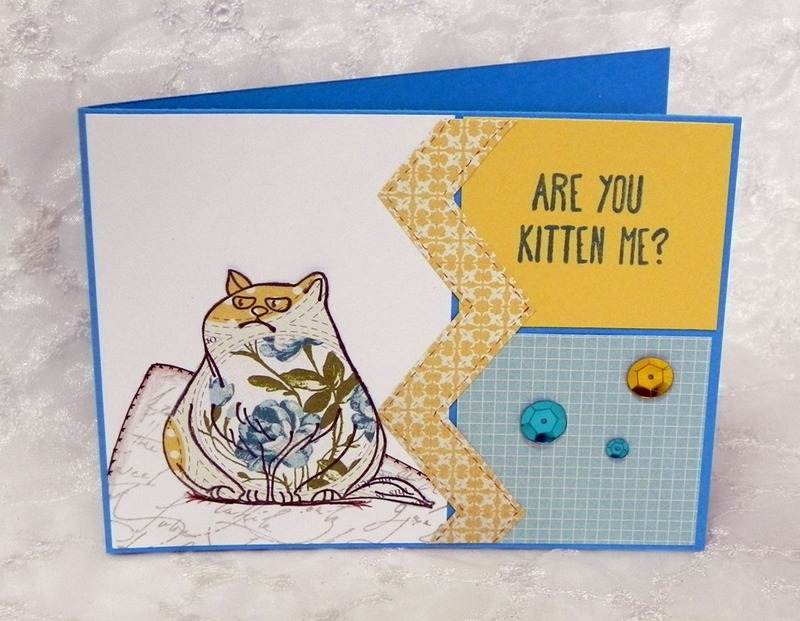 My usual “switch” is between cards and scrapbook layouts with the occasional sewing something thrown in the mix. Crochet has reentered. The ladies of the church have started talk about the Christmas Cottage sale coming up early November. Ideas were being thrown out and I was encouraged to join the crocheting and knitting group that I have only visited a couple of times over the years. With the success of the “Brain Grain – Wheat Belly” program I have felt like being social again so I showed up this past Wednesday. How nice it was to sit and join in the conversations without that feeling of imploding from depression. I had grabbed a skein of my cotton yarn before going so I could at least work on something, even a wash cloth. 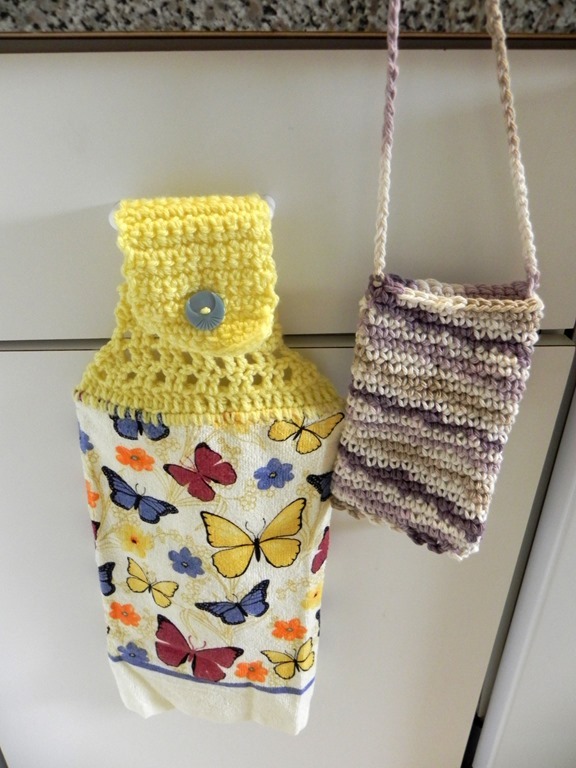 Well, someone suggested that yarn would be great for the heart monitor bags they give for the old folks. After being advised of the dimensions I got started. This week my activities have included finishing up a stack of cards to submit to Take Ten , a few scrapbook pages, a heart monitor bag, and two toppers to kitchen towels for hanging. Not to mention that my ability to socialize has taken a turn. Since hearing of the group meetings at the camera shop I had wanted to go to them. Last night I actually went to the Nikon Users group hoping to begin to learn more about my camera. It’s a good 30 minute drive. When I pulled into the parking lot I saw a few cars but not many. I began to wonder what I should do to find them, I was picturing in my head a group standing outside because I knew the store was closed so I figured we would be told where to go once 6:30 arrived. I saw a man get out of his car and start to check doors, so I got out too. Another man approached the first. As I was walking up the man told us there was a sign saying this group was canceled because of the weather. How disappointing! And the nasty weather had passed. Oh well, that’s a step in the right direction for me even if I didn’t get to actually join the group. Next month. Daughter just got back from her companies convention in Phoenix. Oh my! 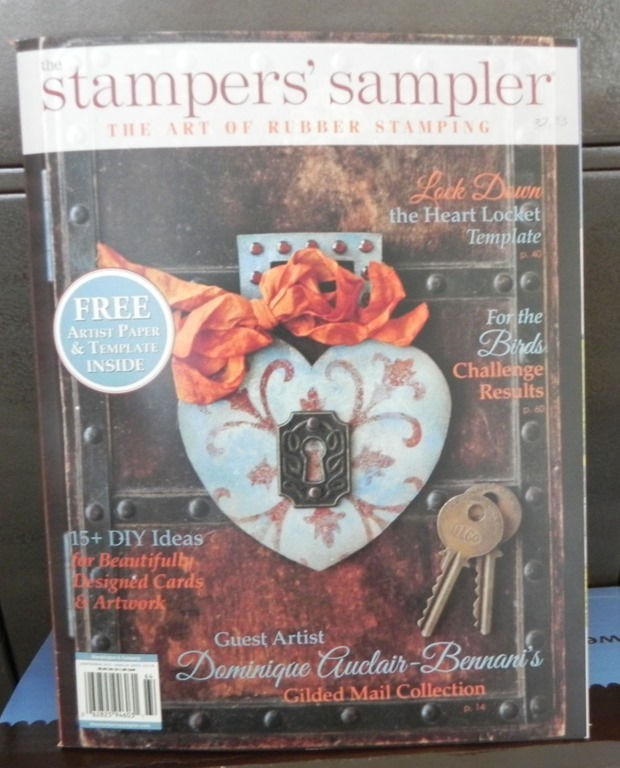 She scored some of the fabulous new Pan Pastels that Fun Stampers Journey will offer as of the new catalogue starting July 1st. I had been wanting pan pastels since seeing how they were used in French Photo Collage scrappbooking. Some ways around it never quite soothed me but I kept plugging away – until now! The first thing I did was to make a card, quicker that putting together an entire layout. My hands were itching to get into those scrumptious, rich colors. For this card I heat embossed in silver the new celestial background stamp then sponged on the colors to make my background. Viewing this image doesn’t do justice to the actual look and feel these colors give. So amazing, actually, and versatile. Colors are mixable, can be made as vibrant as you want (soft here), can be lighten, or blended. There is also the silver and gold. Those pans alone are awesome for adding shimmer and shine to ANY project. If you want any of these Fun Stampers Journey images or other product, please email my daughter at kldeyette@yahoo.com, she doesn’t pay for the site any longer but does order our supplies all the time. Not only is this issue filled with inspiring cards and ideas to get your new year crafting mojo whirling, but something special from me. 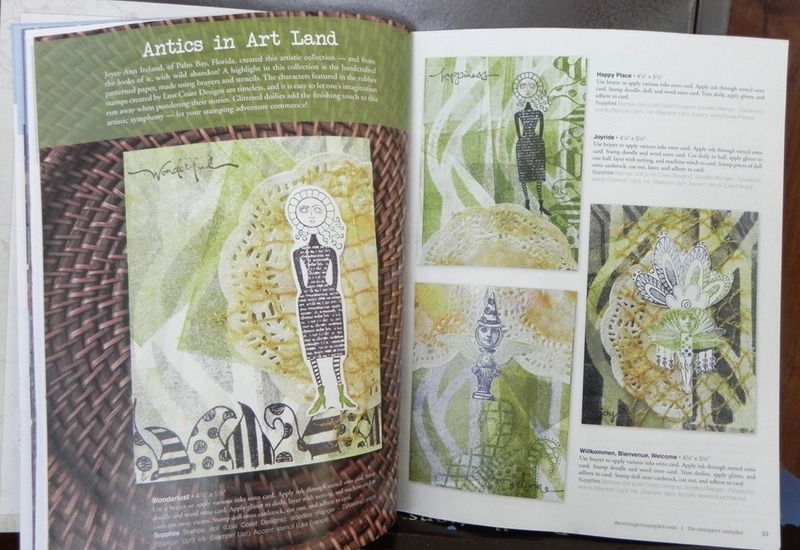 I have a double page spread – how exciting us that! This hit the stands at the beginning of this month, fresh inspiration to start the new year off right. I had some serious creative fun putting these cards together. Wait till you read the intro she wrote about these – wow! So, I hope you enjoy this magazine as much as I do! 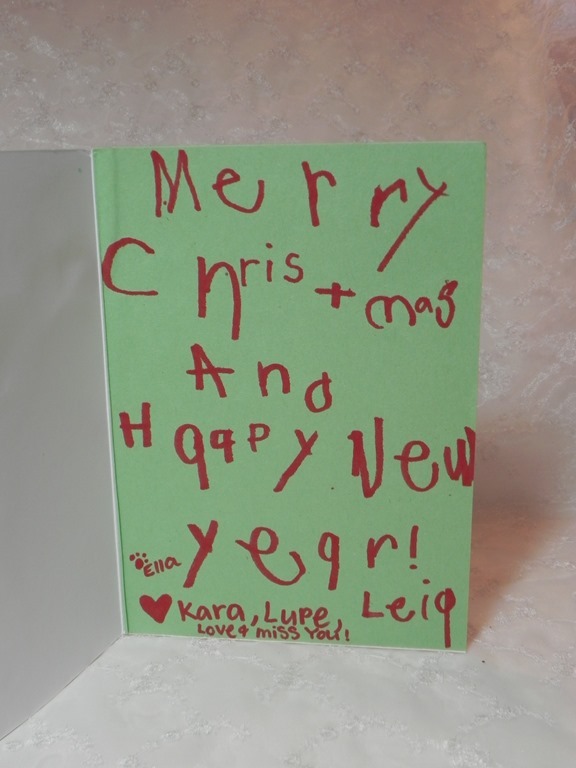 Receiving this in the mail yesterday was a most precious greeting from my granddaughter. 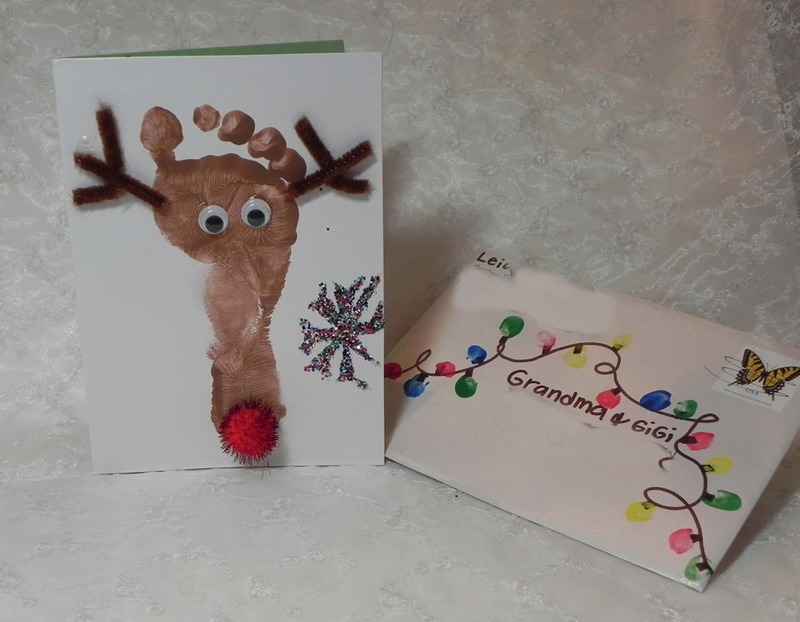 She helped my little 4 year old great granddaughter create this card for us using her prints – foot for Rudolph and fingers for the string of lights. DGD has been mentioning they have gone to Michael’s a couple of times and let me tell you, that is music to a crafting Granny’s ears. When I still lived up there she would occasionally come into my craft room to make a card to give to her friend. So she has the “gene” in there! The other day Kara texted this photo to us. It spoke to me immediately. I knew I wanted to do a scrapbook page right away. A weird thing happened when I got the photo copy from Walgreens, I lost it. Really couldn’t find it anywhere and I know I had left the store with it. So I ordered another. This morning, once the page was complete, I found the photo. Isn’t that how it always is? I opened the passenger door to my car and there it was, fallen between the seat and door, impossible to be seen without opening the door, which I obviously hadn’t done. All is good in the end, I still think this is a precious photo and it will likely be used again in something, somewhere. 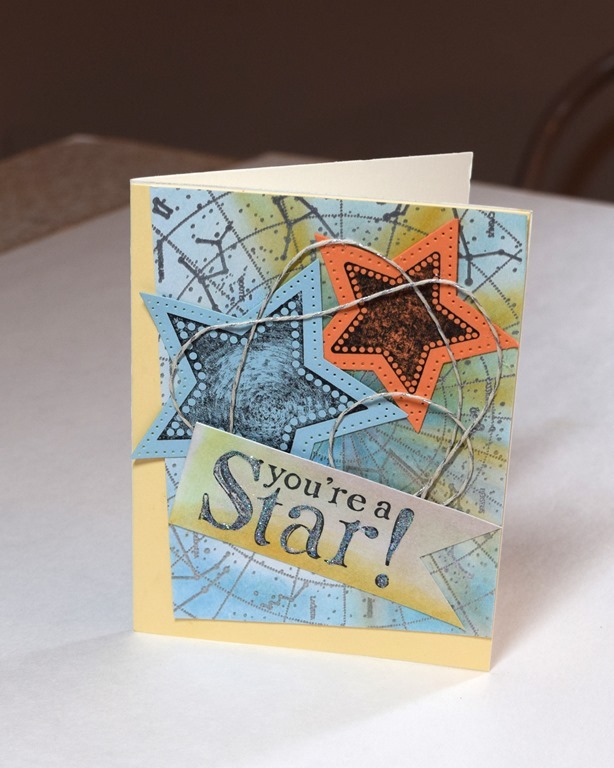 For the base I used a sheet of beautiful pattern paper from the “Vintage Paris” collection by Fun Stampers Journey. It is a most dreamy collection of soft colors and delicate patterns. 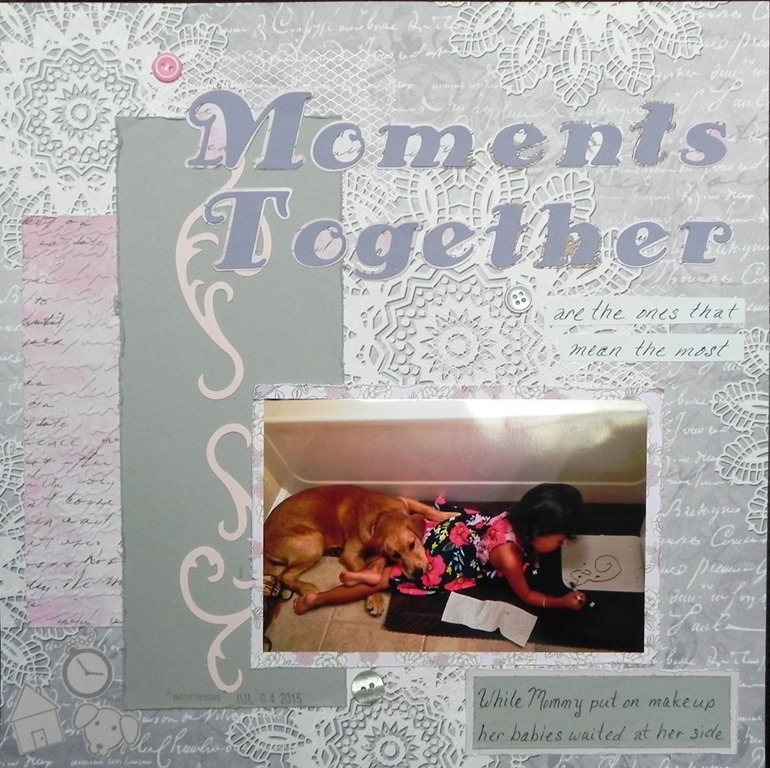 This page is the product of an inspiration layout for a challenge on Splitcoast Stampers site where we had to choose one from all the past uploads for the Virtual Scrapbook Night challenge. There were lots and lots of pages to go through. As soon as I spotted Sharon’s page here: I knew that I wanted to use the photo that I did. For my background I added some rubber stamping. 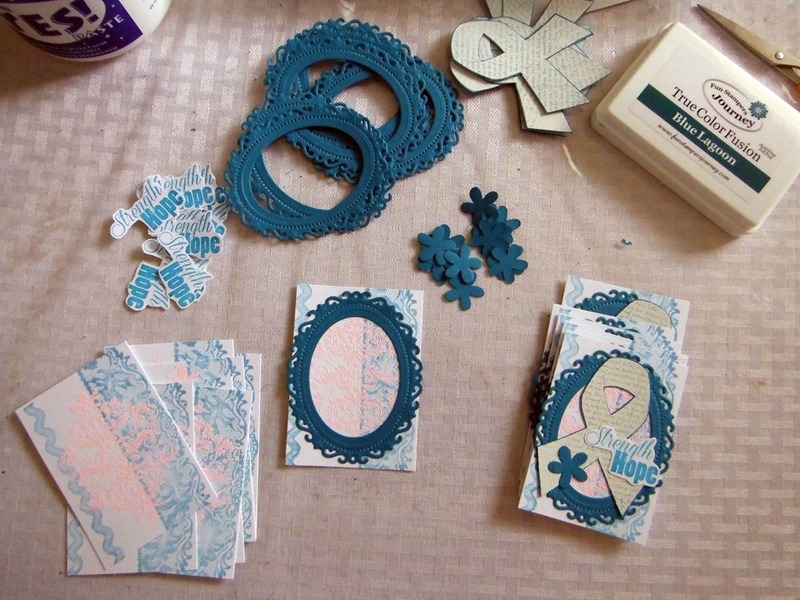 I used pink SU embossing powder with the Fun Stampers Journey background Basics stamp. (SS-0008 from rep #96). Here is a close up of the background stamp, just soft and subtle. Not that this intricate design on the paper really needed it, I still think it adds a bit more charm with it’s texture and color. You can also see the letters I made with the Cricut cartridge Hello Kitty Fonts. For my flourish, Sharon has a large one, I cut two from the Tim Holts Elegant Flourishes die from some scraps of Pink SU solid cs. 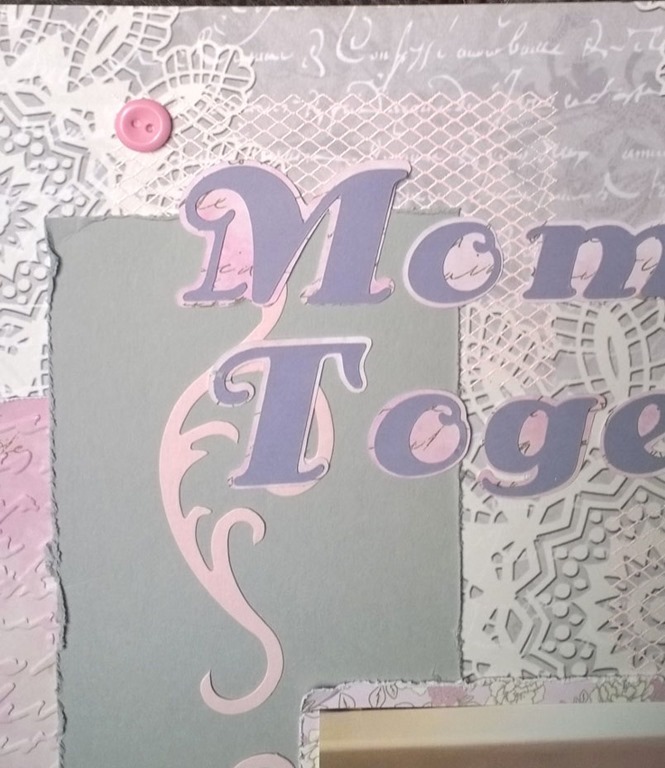 Although Sharon did not do this, I added a smaller strip to the larger gray of pattern paper that I had dry embossed with a Cuddlebug script folder. Added a bit of interest, I hope. Each of the edges have been distressed, as well as the delicate floral print under the photo. I had wrote the sub-title and the journaling. Tiny Top is now in ballot and gymnastics, and her Gigi is certainly looking forward to more photos to play with in scrapbooking. I went with Teal and Teal and White. It covers two ribbons. Cervical and Ovarian cancers. Here is a photo of the process. After stamping the white card I felt it needed a little something more so I used light pink embossing powder with the FSJ Damask stamp. The Spellbinders oval frame was cut and them run through the Journey Grand to emboss every little detail – love it! 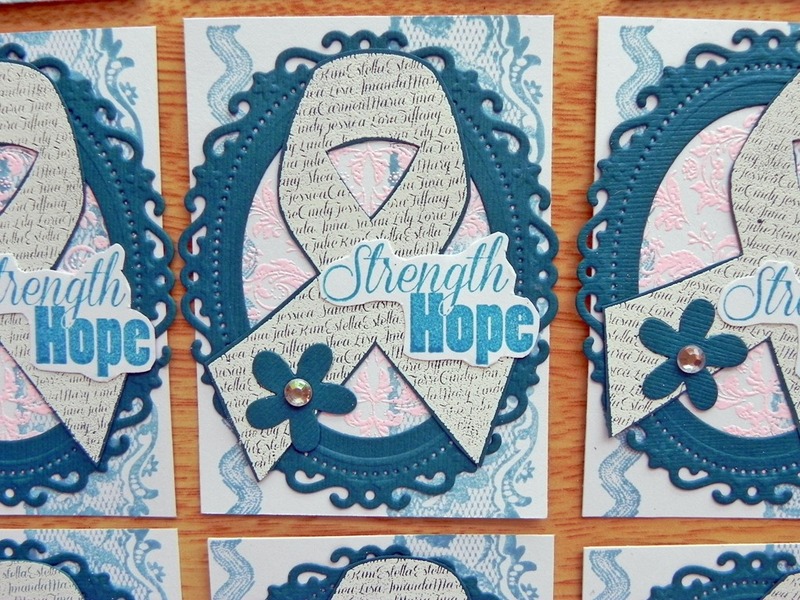 The ribbon is white embossing powder over the Blue Lagoon card stock – the smooth side. The flower is from the Spring Blooms Mini die. I can’t wait to see what everyone else sends me! 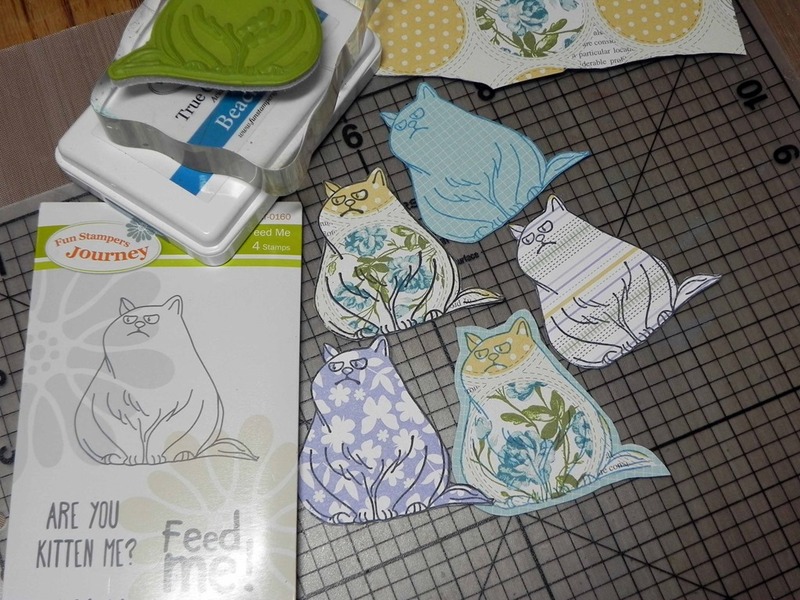 Be sure to check out Kristy’s shop for the Fun Stampers Journey supplies I used here and join the swaps on her Kristy’s Bloomin’ Journey Facebook page. Up for a Crafting Frenzy? Time to heat it up and throw your thinking away. Thinking gets in the way of doing. Are you thinking yourself out of making something today? I’ll guess often you look around your crafting supplies and either 1. Feel inspired, or 2. Feel overwhelmed. You are thinking yourself right out of creating. You think about making something all the time, but how often do you actually create? If you love crafting, but are not making something artful, ask yourself why. The nature of the human mind is to know much, control much, to first understand all of the how, before proceeding. Too much thinking overrides the naivety of the free mind of exploration, leaving you stuck in first gear with no fuel to further engage. For example, you have a special event rapidly approaching and you know a hand crafted greeting card would be so much more meaningful. You look around your pretty colors of paper and ribbon thinking about the colors that would be perfect for this special someone. Feeling inspired, you start to pick two colors that “go” together. But then you hesitate. “Would that be too high of a contrast? Are they boring? What if the intended person hates that color?” You end up thinking yourself right out of making a card. Have you picked up on where I am going yet? I am saying: stop thinking and do something. Thinking has its place, most definitely! But our thinking can stifle our creating art. What you think is just a small piece of the puzzle. Who you are inside is already wonderfully artful. Let your other senses come into play. When colors and shapes spark a feeling of excitement and joy, go with it first before you think too much. Thinking will come as it is needed for the mechanics of the project. Here is a challenge for you. Listen to your heart and pick some supplies out of your art stash. Abandon ideas of what you should be working with today. Gather the elements, colors, tools that create even the smallest spark of joy. Bring them into your work space. Begin to see without a plan. Like a young child, allow your imagine to see what could be. What takes shape? Give your mind a chance to see what is happening. Move a combination of colors and patterns, allowing pieces to catch your eye. The natural design will start to take form as you look, rather than think how it is supposed to be. Now, you have elements that look happy to you and you may apply the task of working up a card, or what you wanted to create. 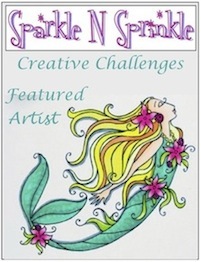 It is an exercise to allow your fun creative side to play first before you think yourself out of making a card in the first place. 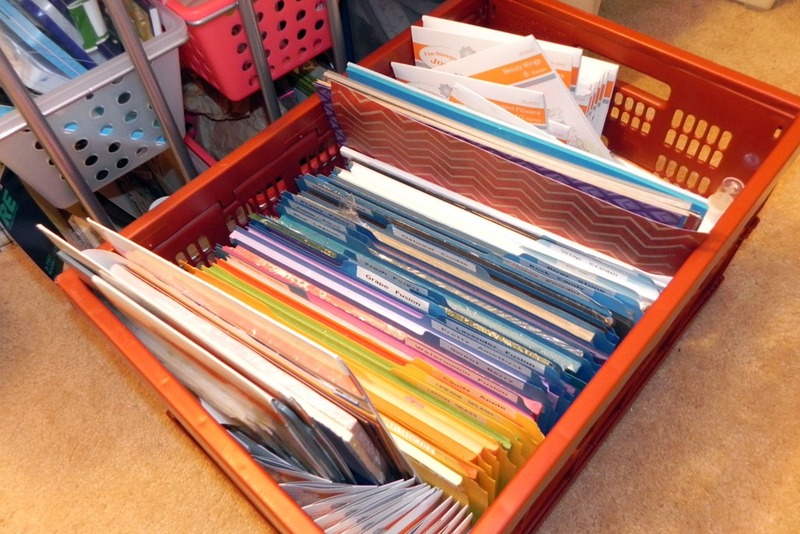 The same idea works for scrapbooking and sewing as well. 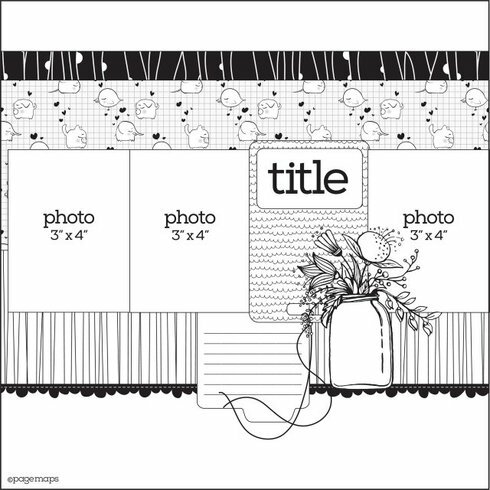 Find your photos from which you want to make a layout, and then allow your eyes and hands to find options for building a page. Feel the elements. Allow your senses to find what feels joyful to you. If you are creating something with fabric as an art piece the field of objects isn’t limited to needle and thread anymore, there is glue too. If you can imagine it, you should give it a try. Give in to your eye for art, rather than thinking it and never starting. Acquiring wisdom and skill are tricky. You can’t “think” you have wisdom and skill. They are developed over time. These aspects come from doing over and over. You are an artist, whether with paper, fabric or the written word. Get busy and create something from what you feel, block the logical thoughts that may be hindering your spark of creativity. I ask you to “bookmark” this post and return to share your results – good or bad – so others may benefit from your fight to not let thinking stop you from creating. Sharing ideas brings valuable insight. We all benefit and learn from what others create. I sincerely hope you will share anything that this post may have sparked.